Stokholm – a capital city of Sweden, Ikea and H&M. I came to this beautiful place to take part in Fashion Tech Talks conference, organized by Patriksson Communication. A day-long event devoted to new technologies in fashion -including future wear, AI and sustainability. An arena where competent professionals from around the world meet in order to discuss important ideas and how technology can solve our industry’s problems. I wanted to use time at this event in the best way possible. So I kindly asked organizers to schedule a few Q&As with H&M representatives. Because which place is better for talking with the brand than Stokholm? There were questions that I had in mind for a while, so I was glad to get an opportunity to ask a least some of them. 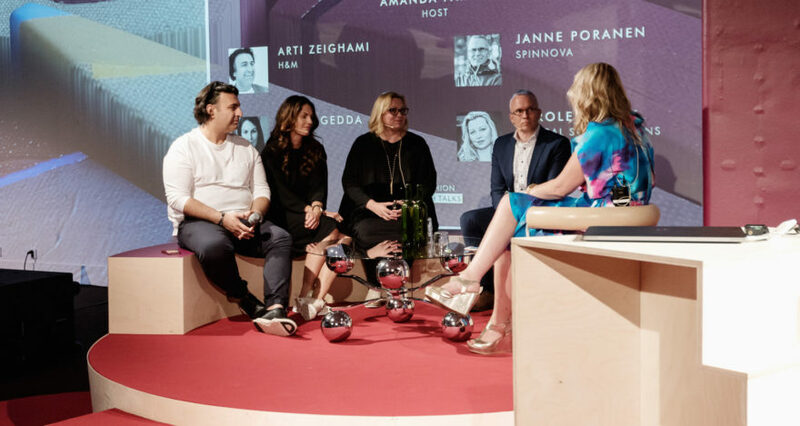 See my Q&A with Anna Gedda (Head of Sustainability, H&M Group), Nanna Andersen (Head at H&M’s CO:LAB) and Elin Frendberg (Business Development at H&M). Apart from PR – which in my opinion includes projects like AR t-shirts for kids (which I showed in my short movie). Company seems to focus on 2-3 goals: increasing sales with production optimalization in mind, sustainability and new business models. 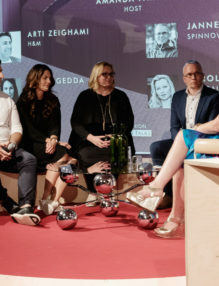 Since, people responsible for H&M Group VC weren’t available at the conference – I focused on the first two: optimalization and sustainability. We saw at least three examples of sales/production optimalization that H&M Group is implementing in their company. AR/Mixed reality production and e-commerce (but also PR). Company is testing HTC Vive – to design and collaborate between their designing teams. Technology itself has a great potential for the future of workplace – where big companies co-operate with remotely working freelancers. But it also allows to cut costs of production – in future clients will choose from designed but not-yet-made clothes in e-commerce (with using software like Looklet – also shown at FTT). Love this potential of “fake it till you make it” approach in fashion. It can make it a lot more sustainable. Company also tests Holo Me technology, with Group’s Monki brand. I really enjoyed it how H&M Group approaches VR/AR/mixed reality tech. Btw. in 2015 I wrote about it how fashion industry can use AR/VR and I’m super excited to see that some of these things are actually already happening in fashion. Artificial Intelligence (AI) – Machine Learning (ML) and Deep Learning (DL) – we haven’t seen much of that at the conference, but I feel like there are very exciting things happening in H&M Group in that area. Company showed their H&M Home usecase of Google Assistant helping a customer to choose furniture. As we also know, H&M has been testing Looklet (technology that allows to show clothes on models, without actually making photoshoots). This tech too – has a huge potential for use of intelligent algorithms when combined with data like: age, gender, skin color and previously searched products. designing only things that will be sold out – to not overuse Earth’s resources and people’s hard work in yet-to-develop countries. But AI is also targeting products that are already in stock in a better, more efficient way. And being a sustainable company is one of H&M’s main goals for the next years. Their 2030 plan to ba a super ethical company is highly interesting and ambitious (closing the circuite/loop on fashion). And even though one of the reasons they set this goal are Group’s actions in the past (and even now, they can do better) – they’re still improving and really set the example here. And you can feel it when talking to people hired there, even if not directly in “sustainable” department. People of H&M are really taking the problem seriously. Not only in brand’s home town – Stokholm, but also in my homeland – Poland. Their apporach to biotechnology and AI in that area makes me feel like we really still have this tiny chance to survive as the human kind. What are my conclusions after Fashion Tech Talks and H&M Q&A? I love it how organizers have chosen topics and speakers for the event. Honestly, I wish I had that big budgets for our community-focused fashion tech events. Mostly to invite most of the speakers to Poland. 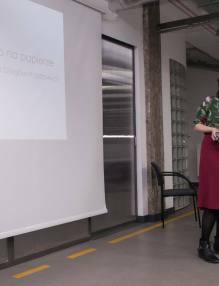 Fashion Tech Talks was a great benchmark for me as an organizer. Awesome to know that there are such great people with similar mindsets in “the North” :). Speakers and many participants were creme de la creme of fashion technology. It was a pleasure to get to know new professionals and reconnect with friends that I usually see only on LinkedIn. Had a blast talking to the women of H&M. how fashion will develop AI algorithms. In the video I was asking Elin Frendberg about it, because I feel like it might be a problem in the future. Even though, we’re still not halfway there… and it’s still uknown whether we’ll develop AGI… (which doesn’t actually matter in that case) In my mind, there should be standards made not only by big fashion companies, and not only in co-operation with huge tech companies, but also by goverments, NGOs, startups, academics and whistle blowers. As soon as possible. And H&M should be one of the leaders in the process. Image source: courtesy of Patriksson Communication. Q&A: Wallace Wu – Misfit Inc. Creating wearables with fashion in mind. Q&A: Gabriela Francuz – regarding the relationship of bloggers with the press, and their influence on it.